I started this site in January of this year, and there are a handful of great neo-noirs that came out last year I didn’t get to cover. I know everybody has already seen these and probably wrote their own review. I still wanted to re-watch these films and television series again and put my own review out there on the world-wide web. Here is the first of those reviews. 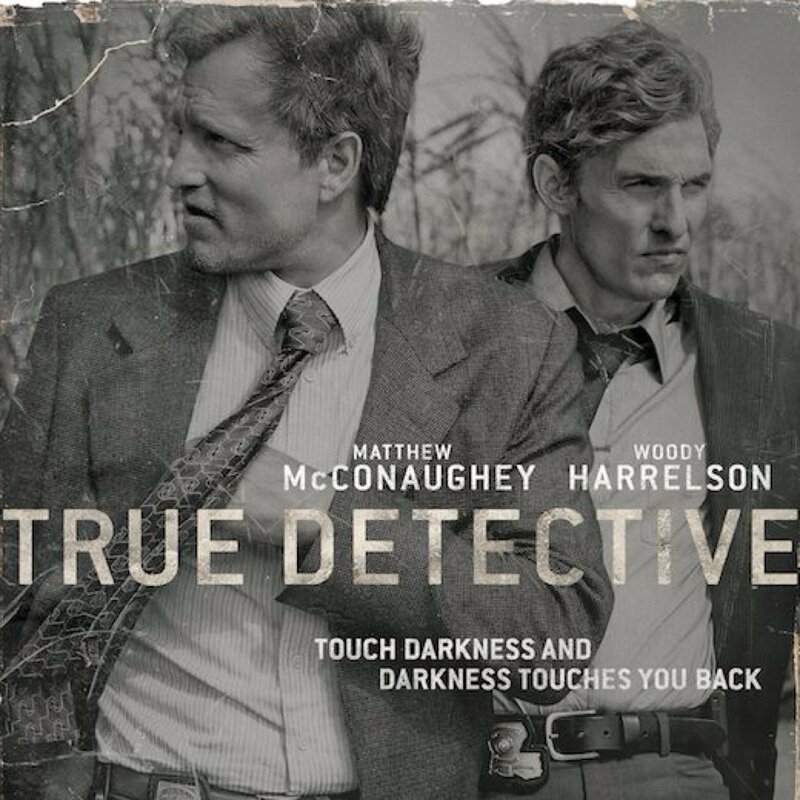 True Detective is an original series from noir author Nic Pizzolatto. I have read Pizzolatto’s novel Galveston before watching this series and found it a very good book. Something fans of the show may want to read. This anthology series stars Matthew McConaughey as Rust and Woody Harrelson as Marty. I would classify both as hardboiled, Rust being the more so of the two. This story starts out with our duo getting interviewed by two detectives played by Michael Potts and Tory Kittles. Both are being interviewed individually about a case that happened 17 years ago. In typical noir fashion we get our story with a series of flashbacks. We quickly see our detectives are worse for wear 17 years after the story started and through 8 episodes we find out why. Our case from 17 years ago is a murder where the body has been staged in a ritualistic way. This case has no suspects or witnesses and very few clues to go on. The clues also leads to some missing children cases that may be related to the murder. Our story takes us to dive bars, whore houses, meth labs, stripper bars, burned down churches and lots of Louisiana backwoods locations. We have a bunch of great characters in this, some are small parts and some are much bigger. Our lead female, is Marty’s wife played by Michelle Monaghan. Marty, and Rust for that matter, keep her away from the darkness of the case. I would consider her Rust’s femme fatale. We also get two more interesting femme fatales, though they are not part of the murders they do trip up Marty in his private life. Alexandra Daddario appears in the first half and Lili Simmons in the second half. The show plays more like an 8 hour movie then a television show. You will want to watch the next episode as soon as you finish one. The story is intricate, intriguing, and addictive. The music is dark and fits the southern Gothic feel, T Bone Burnett did a great job with the score. We will be getting a season 2 of True Detective this summer. It has a high standard to live up to and I hope it can. The new cast looks outstanding and the trailer looks great. We go from our country noir setting to one of the most famous of noir locales in Los Angeles. 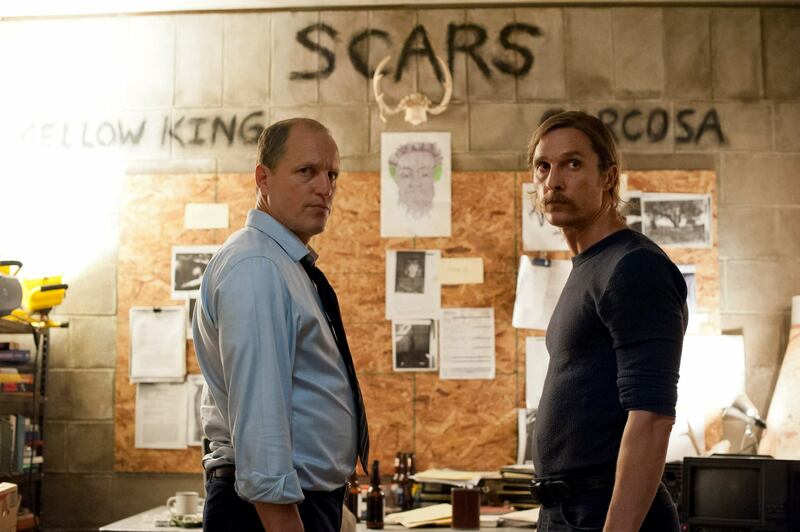 Can Pizzolatto keep the dark, intensity with the city landscape, a new story, and a new cast? I look forward to seeing it and if it’s as good as the first season we are in for a treat. I love the first season I bought the DVD and started watching I was hooked. I can’t wait until season 2. Nice review.